At Inspired Eyes Optometry, we strive to create a personalized eye care experience to ensure our patients have the best vision possible – both now, and for the rest of their lives. With in-house retinal imaging and our full scope Optometry clinic, we pride ourselves in staying current with the latest technologies and developments in eye care. We offer appointments for adult and children’s examinations, eye emergencies, contact lenses, post-LASIK management, and even management of a number of eye diseases. Located in the heart of downtown Kelowna, Dr. Danny Walker is available for evening and weekend appointments. His patients appreciate that he takes the time to listen to their individual concerns, answer their questions and teach them about their eye health. Dr. Walker has a special interest in protecting and maintaining optimal visual health through a variety of factors that include lifestyle and nutrition. These lifestyle recommendations can be particularly helpful in the prevention and management of a number of common eye conditions, such as Dry Eye, Cataracts, and Macular Degeneration. Dr. Walker’s passion for educating patients about the health of their eyes is evident in the interactive and thorough eye examinations he provides. Children: To ensure optimal eye health and development it is important for your child to have their eyes examined. Even before your child can walk or talk, we can evaluate the development of their eye movements (detecting “lazy eye”), eye health, and even their developing eye prescription (farsightedness, astigmatism, etc). We recommend examinations at 6 months, before starting kindergarten, and annually through the school years. Adults aged 19 to 64: Adults should have an eye exam at least every two years or more often if required to monitor other health conditions, such as Diabetes. Some of the more common conditions within this age group are blur or difficulty focusing at near, dry eyes, and digital eyestrain, or Computer Vision Syndrome. Seniors aged 65 or older: For seniors, the risk of eye conditions increases significantly. We monitor for Cataracts, as well as potentially sight-threatening eye diseases, such as Diabetic Retinopathy, Macular Degeneration and Glaucoma. Detecting these conditions in a timely manner and appropriate management is crucial to your long term eye health. We highly recommend seeing us yearly for a thorough eye examination, which includes dilation and retinal imaging. If you are looking for a new Kelowna optometrist, contact us for more information! Dr. Danny Walker hails from Mississauga, Ontario, and has been practicing Optometry in the Okanagan since 2015. Dr. Walker completed both his Bachelor of Science and Doctor of Optometry degrees at the University of Waterloo, graduating in 2012. He was voted by his fellow classmates to receive the Dr. Michael Gutwein Memorial Award in his final year of Optometry school, awarded to the most social and involved student in the class. 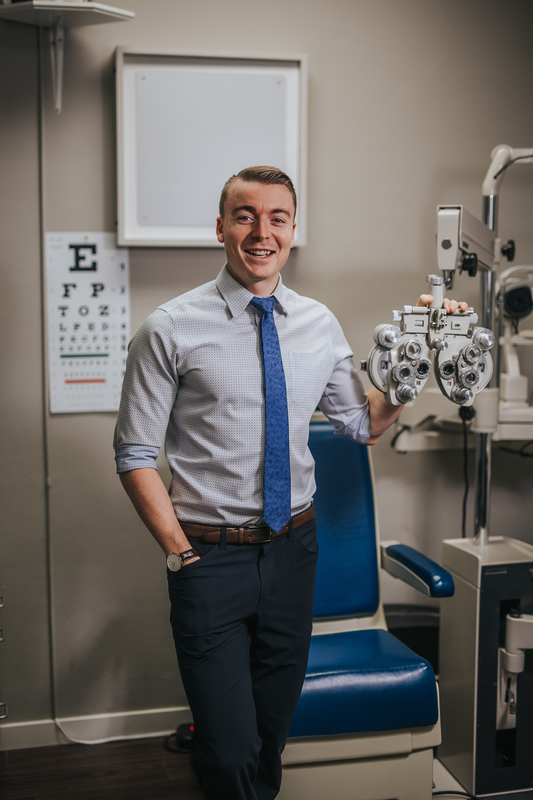 Upon graduation, he moved to Corner Brook, Newfoundland for three years, where he had the opportunity to practice full-scope Optometry in a variety of rural locations. Dr. Walker has completed additional training in the area of Vision Therapy & Neuro-Visual Rehabilitation, as well as Ocular Wellness & Nutrition. He is a member in good standing with COVT&R, and the OWNS. These areas are complementary to his passion for protecting and maintaining optimal visual health throughout life.